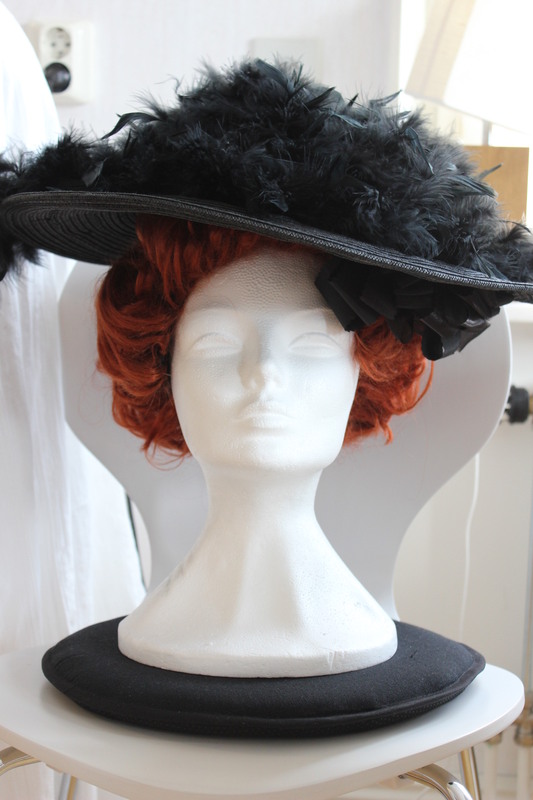 I decide early that I was going to make an Edwardian hat for the HSF ? : Tops and Toes. 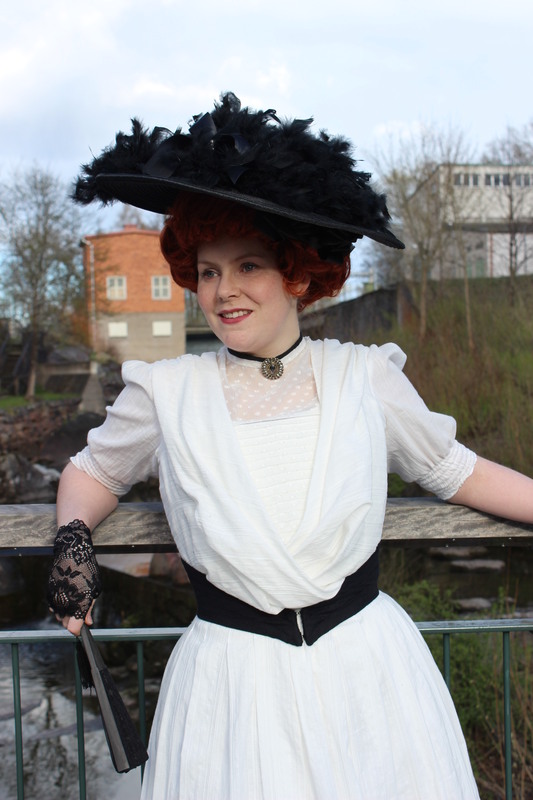 My original plan was to make a matching hat to wear together with the prevoulsly made edwardian “Farytale”gown, to a upcoming event. But as you can guess my planes changed a bit once I decided I hated it, and would never wear the “Ariel/Farytale” gown again. 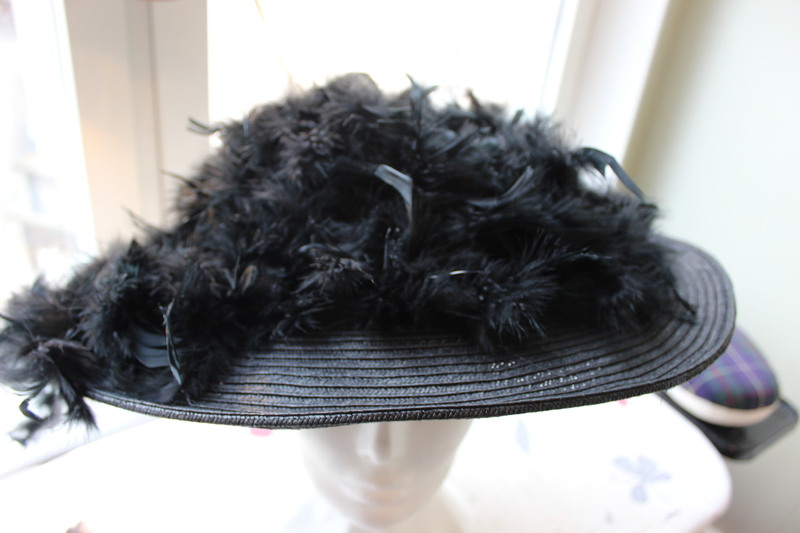 The new plan is to make a hat be-fitting of the faboulus Camille Clifford. And since the dress is now re-styled after one of her dresses, what would be better then to also make the awsome, gigantic hat to match. 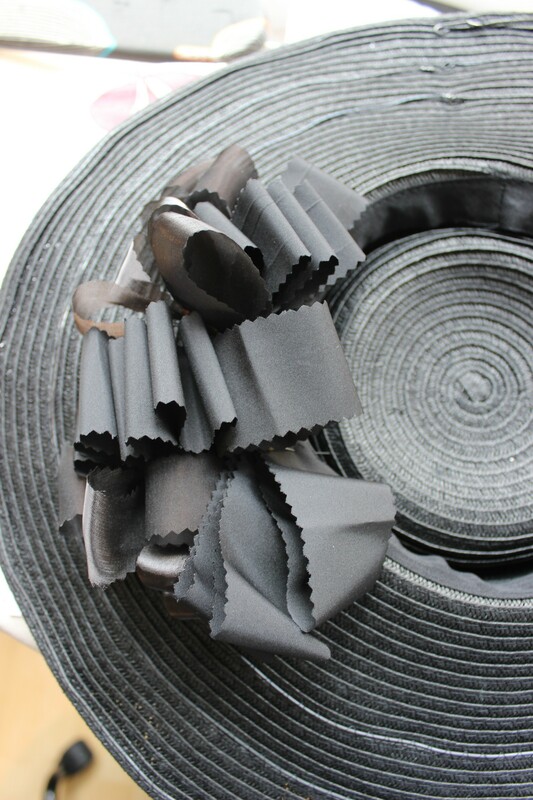 The only problem was – I’ve never made a hat from scratch before… Ok, I’ve made a 19th century bonnet, but nothing this complex, and huge. 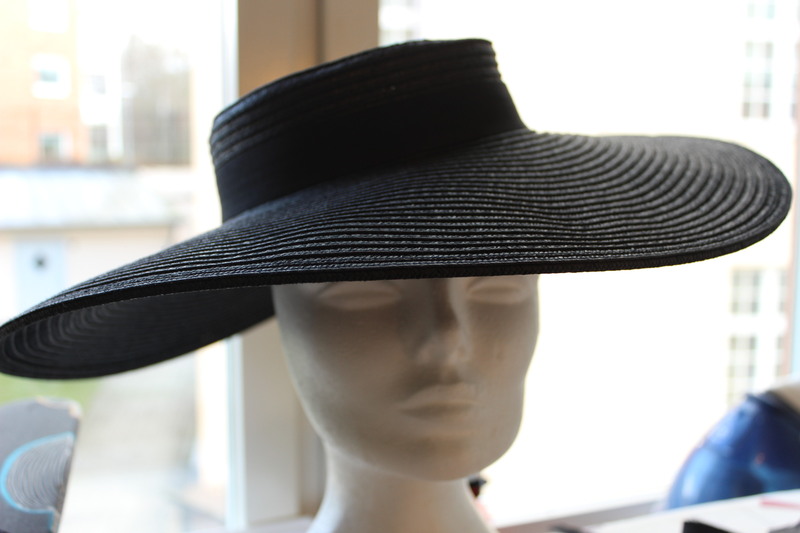 I started searching for some pattern layouts on the internet, and was just about to start the drafting, when I stumbeled on this hat hanging in a store. Since it was both the perfect size and colour, I took the easy way out and bought it. Since it was so big I decided it needed a bit of strenghtening to get the right shape. 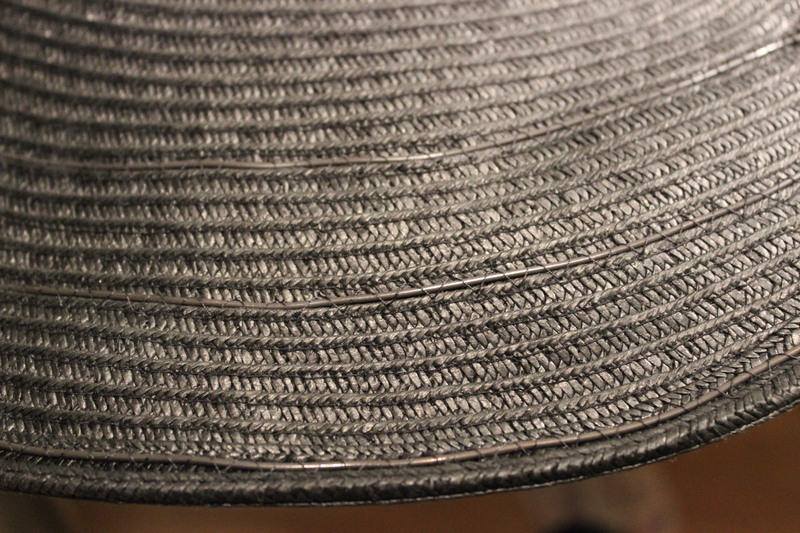 So I grabbed my metal wire and got to work, sewing it on to the brim. Bending the edges of the wire so not to poke through the straw. Then I did the same thing two more times. The high crown of the hat neded to be lovered to get the right look. But instead of cutting, I decided to just poke it down on itself. A few stiches and the crown are now les the half its original hight. 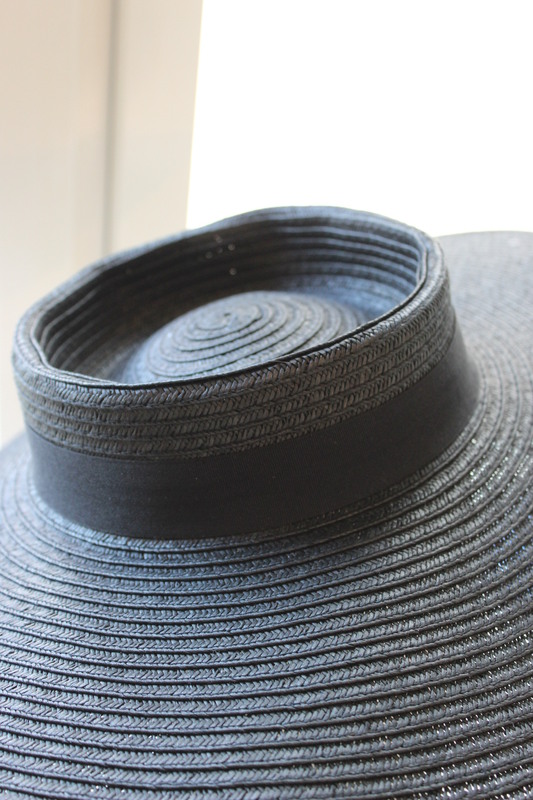 And since you will need a hatpin to keep it in place anyway, the low crown dosen’t bother me. Time to deal with the dcorations. 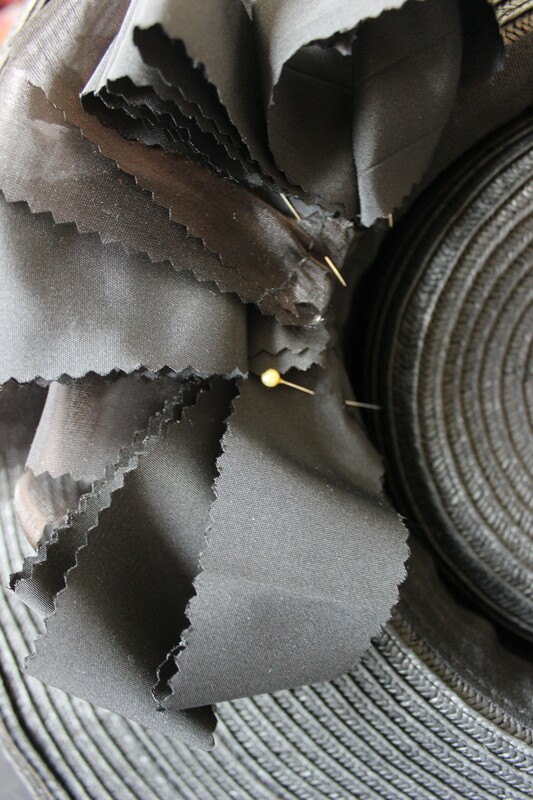 I strated by cuting shreads from some of my black fabric scraps. Then I gathered them to litle “clusters”, and arranged them beneath the brim. 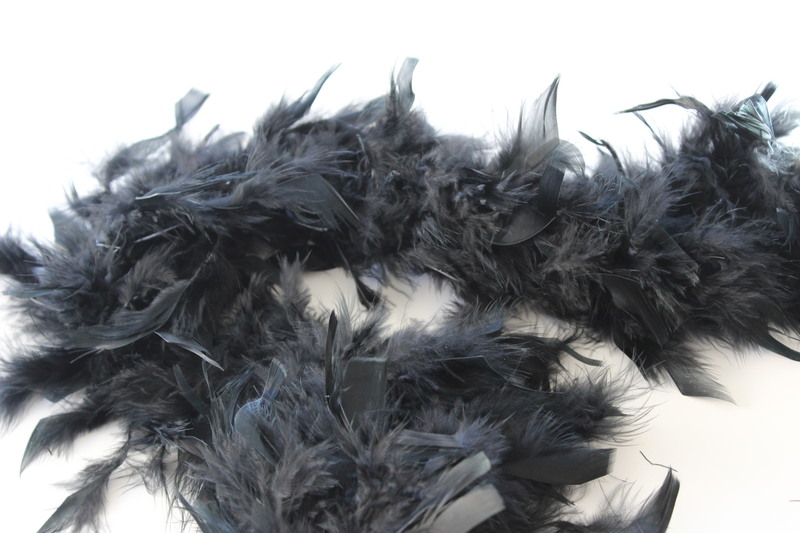 Then it was time for some feathers. I used a feather “boa” I bought for this pourpose. 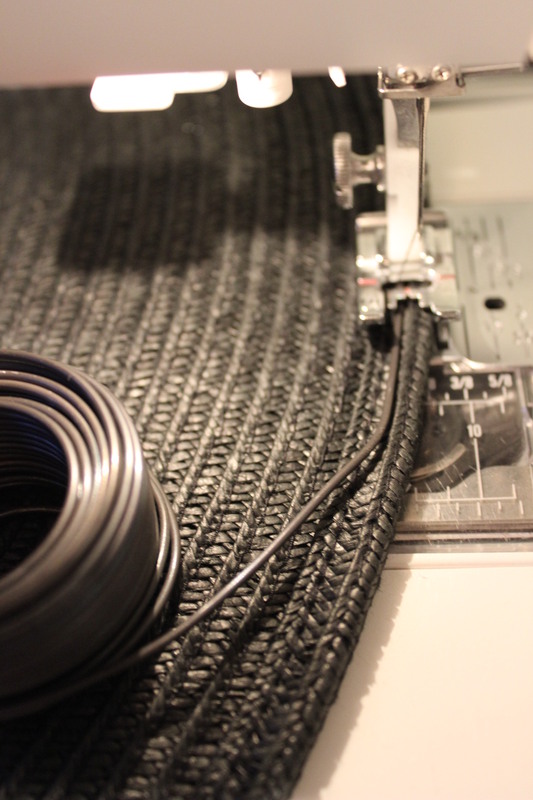 Triming of those ugly ends. 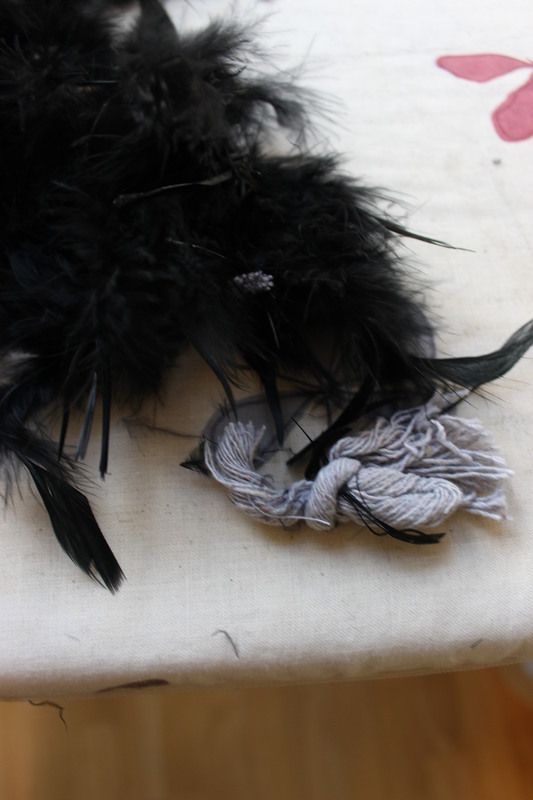 And carefully stiching the feathers on, cirkeling the crown. 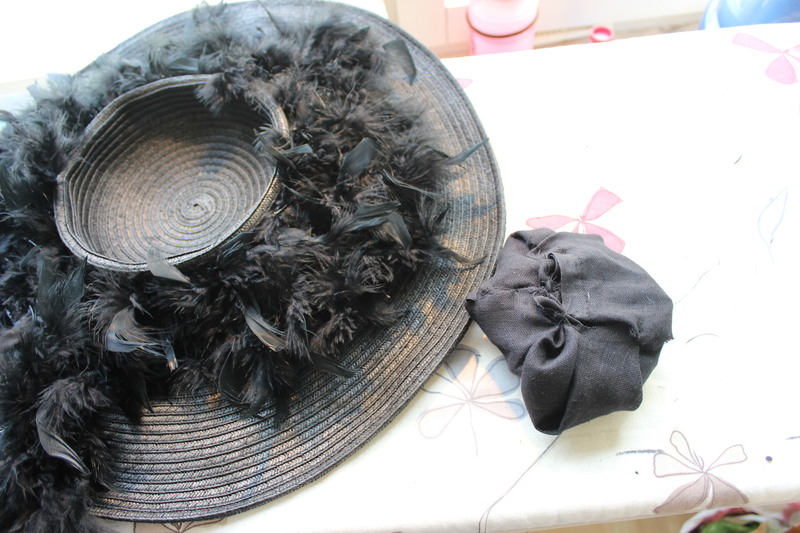 I then realised I didn’t had enough feathers to fill the hole in the crown. 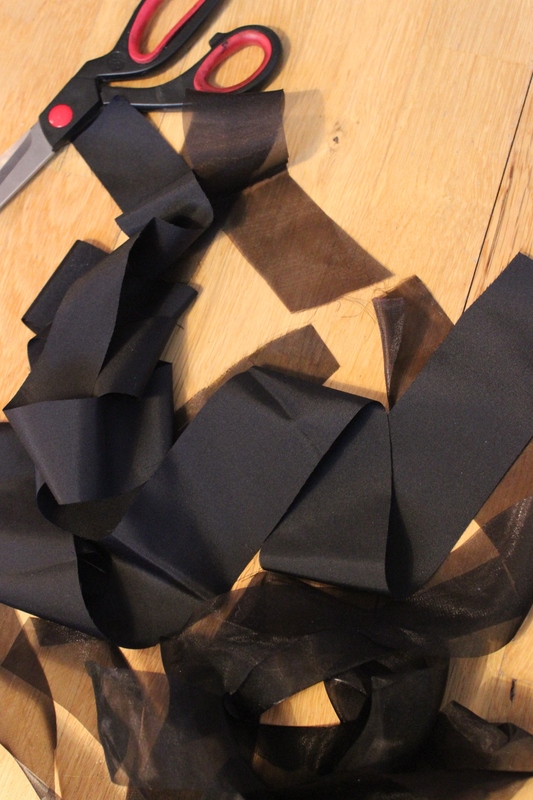 So I found some black fabric scraps and made a quick litle bundle. Which I putt in the crown and attached by a few stiches. 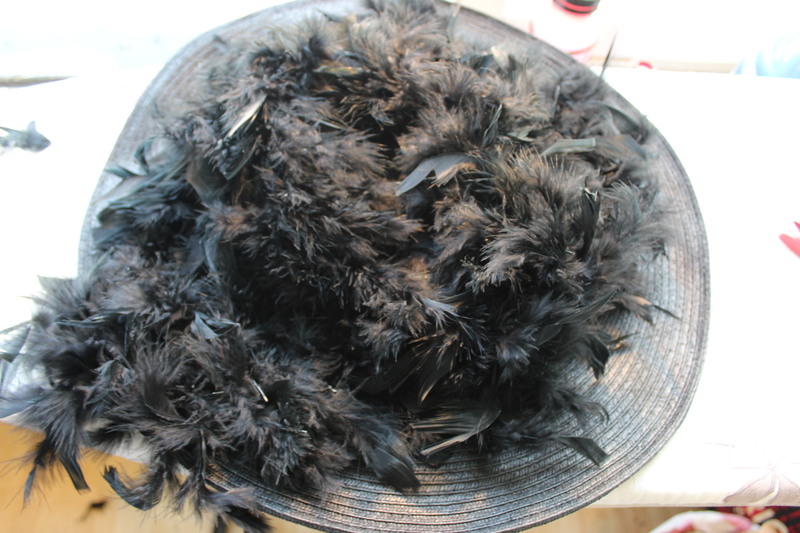 Then I could continue attaching the feathers on to the neewly created lower crown. Challenge: nr 7 – Tops and Toes. 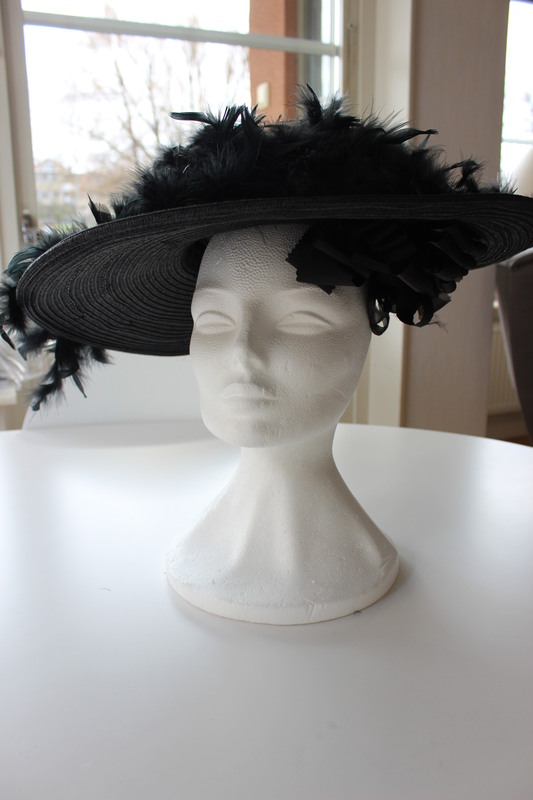 What: An Edwardian “Picture hat” (ca 1905s). 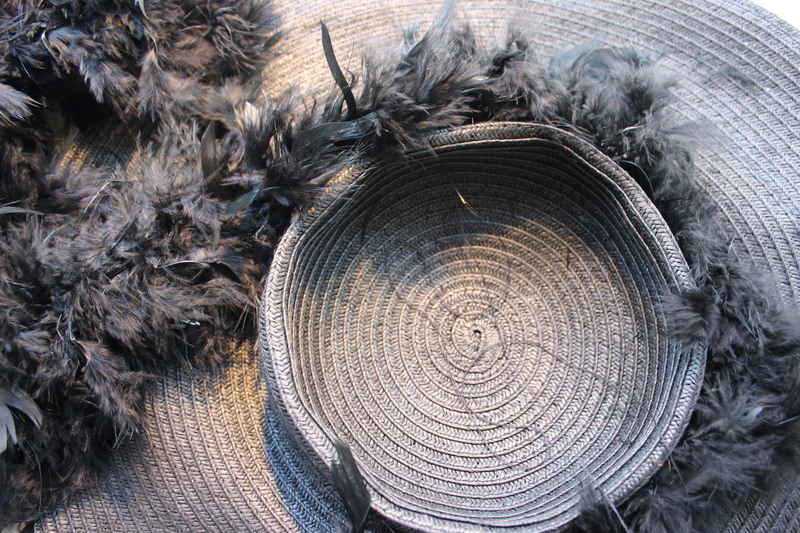 Notions: a black straw hat, thread, steel wire, feathers 1,5m, fabric scraps and ribbons. Historical accuracy: Not at all. Totaly modern construction. 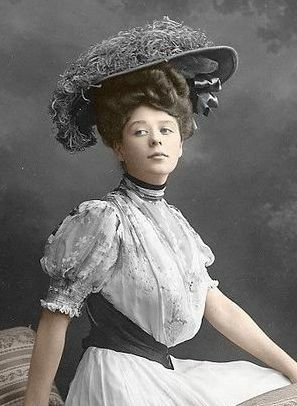 It may pas for edwardian but I doubt the laydy of the day would ever consider wearing it. First worn: At easter for a photoshoot. Maybe I will wear it mid may for an event. Final thougts: I’m pretty happy about it. 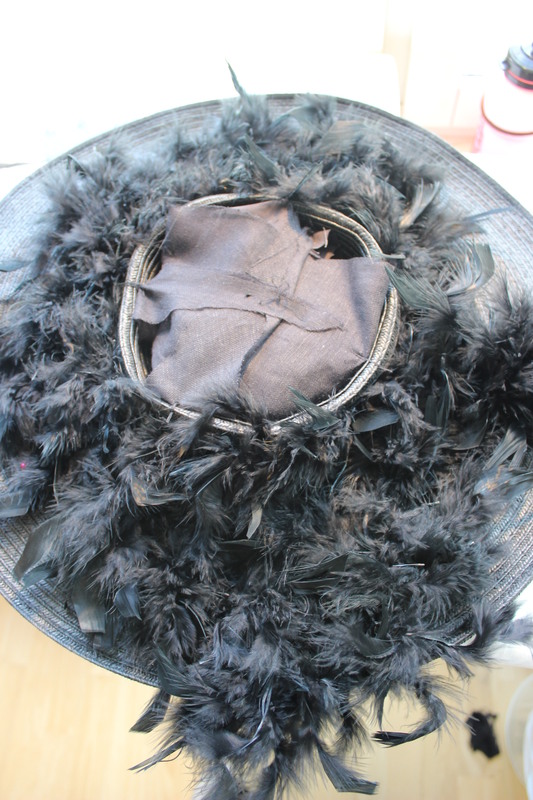 And it looks even better since I pinned a satin ribbon and broch to it, to break up all those feathers. I just need to get my hands on some hatpins to keep it more firmly on my head. Yeah!! 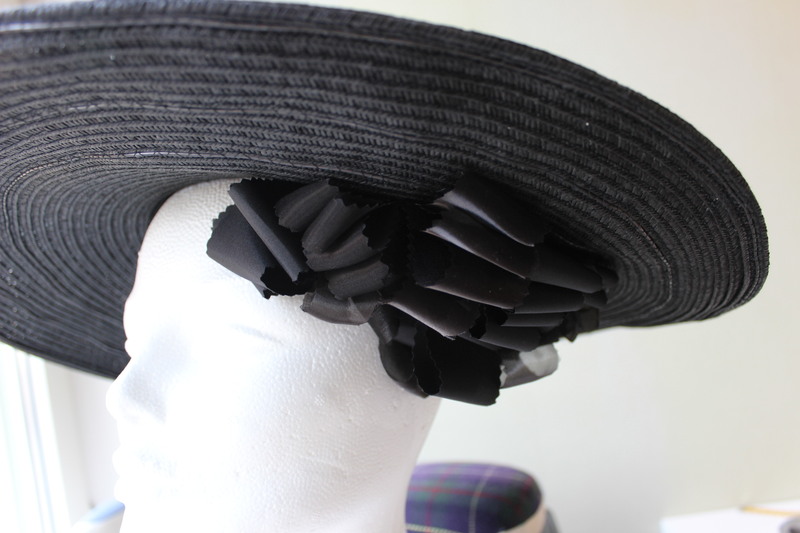 Your repurposed hat is marvelous!! Good job on the wiring! 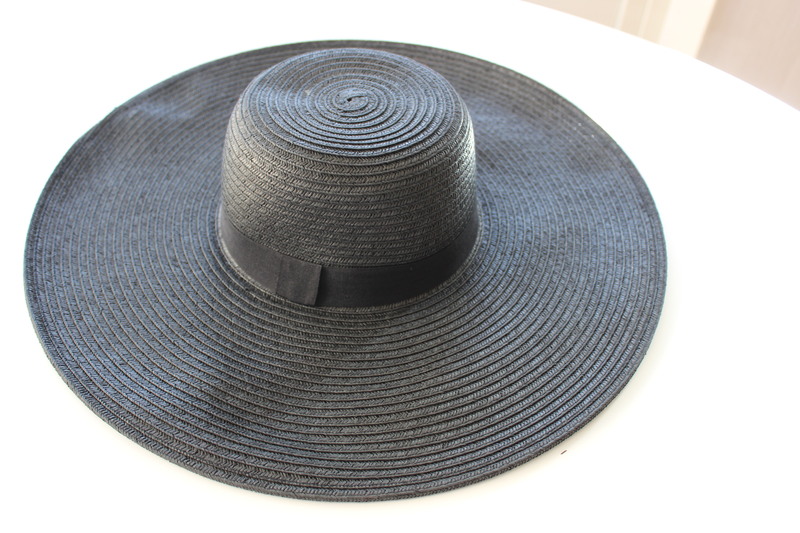 I think Camille was so fabulous….what a lovely image she made and your picture of you wearing your dress and hat are wonderful! 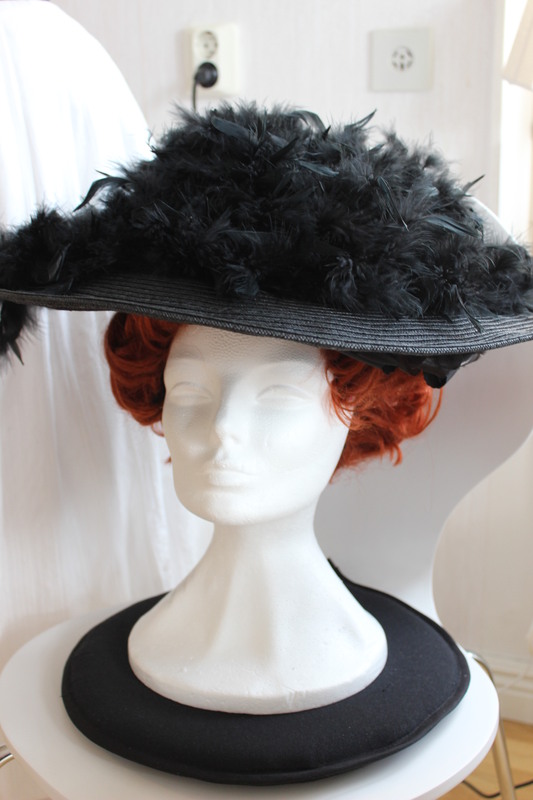 You’ve done such a great job turning such a simple hat into an impressively Edwardian one. 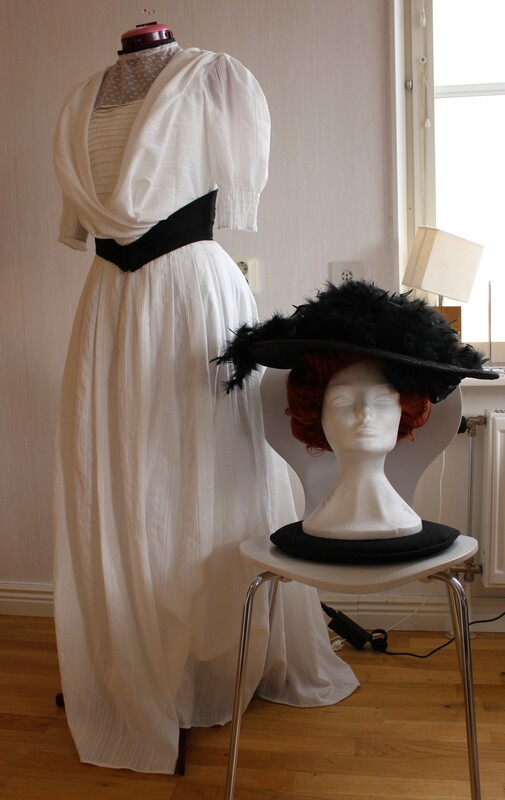 I love the totally black hat with the white dress too, very striking. Thank you, it was such a simple and fun project.